Particularly stock options for the c-level. The behavior of Congress can be modeled by the same process that causes avalanches in sandpiles. And with that, hit the link and read the entire short bit. It is worth it. With all the news about nanotechnology and wiring that’s been coming out over the last year or so, this release is no surprise. A new generation of ultrasmall transistors and more powerful computer chips using tiny structures called semiconducting nanowires are closer to reality after a key discovery by researchers at IBM, Purdue University and the University of California at Los Angeles.The researchers have learned how to create nanowires with layers of different materials that are sharply defined at the atomic level, which is a critical requirement for making efficient transistors out of the structures. “Having sharply defined layers of materials enables you to improve and control the flow of electrons and to switch this flow on and off,” said Eric Stach, an associate professor of materials engineering at Purdue. Electronic devices are often made of “heterostructures,” meaning they contain sharply defined layers of different semiconducting materials, such as silicon and germanium. Until now, however, researchers have been unable to produce nanowires with sharply defined silicon and germanium layers. Instead, this transition from one layer to the next has been too gradual for the devices to perform optimally as transistors. The new findings point to a method for creating nanowire transistors. The findings are detailed in a research paper appearing Friday (Nov. 27) in the journal Science. The paper was written by Purdue postdoctoral researcher Cheng-Yen Wen, Stach, IBM materials scientists Frances Ross, Jerry Tersoff and Mark Reuter at the Thomas J. Watson Research Center in Yorktown Heights, N.Y, and Suneel Kodambaka, an assistant professor at UCLA’s Department of Materials Science and Engineering. Whereas conventional transistors are made on flat, horizontal pieces of silicon, the silicon nanowires are “grown” vertically. Because of this vertical structure, they have a smaller footprint, which could make it possible to fit more transistors on an integrated circuit, or chip, Stach said. “But first we need to learn how to manufacture nanowires to exacting standards before industry can start using them to produce transistors,” he said. Nanowires might enable engineers to solve a problem threatening to derail the electronics industry. New technologies will be needed for industry to maintain Moore’s law, an unofficial rule stating that the number of transistors on a computer chip doubles about every 18 months, resulting in rapid progress in computers and telecommunications. Doubling the number of devices that can fit on a computer chip translates into a similar increase in performance. However, it is becoming increasingly difficult to continue shrinking electronic devices made of conventional silicon-based semiconductors. “In something like five to, at most, 10 years, silicon transistor dimensions will have been scaled to their limit,” Stach said. Transistors made of nanowires represent one potential way to continue the tradition of Moore’s law. The researchers used an instrument called a transmission electron microscope to observe the nanowire formation. Tiny particles of a gold-aluminum alloy were first heated and melted inside a vacuum chamber, and then silicon gas was introduced into the chamber. As the melted gold-aluminum bead absorbed the silicon, it became “supersaturated” with silicon, causing the silicon to precipitate and form wires. Each growing wire was topped with a liquid bead of gold-aluminum so that the structure resembled a mushroom. 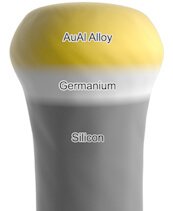 Then, the researchers reduced the temperature inside the chamber enough to cause the gold-aluminum cap to solidify, allowing germanium to be deposited onto the silicon precisely and making it possible to create a heterostructure of silicon and germanium. The cycle could be repeated, switching the gases from germanium to silicon as desired to make specific types of heterostructures, Stach said. Having a heterostructure makes it possible to create a germanium “gate” in each transistor, which enables devices to switch on and off. The work is based at IBM’s Thomas J. Watson Research Center and Purdue’s Birck Nanotechnology Center in the university’s Discovery Park and is funded by the National Science Foundation through the NSF’s Electronic and Photonic Materials Program in the Division of Materials Research. From KurzweilAI.net — It’s been awhile since I’ve blogged on graphene. For a time there news was coming out hard and fast about the nanomaterial. The latest news comes out of UCLA on a relataively simple method of creating large (well, large in the nanoscale sense) pieces of graphene. Researchers at the University of California, Los Angeles, have found a simple way to make large pieces (tens of micrometers wide) of the carbonmaterial graphene that can be deposited on sheets on silicon wafers to make prototype field-effect transistors. Electrons flow through graphene sheets tens of times faster than they flow in silicon, so graphene could lead to electronic devices that are smaller, faster, and less power-hungry than those made of silicon. Thin and transparent, graphene is also a promising replacement for the indium tin oxide electrodes and the silicon thin-film transistors used in flat-panel displays. LIVERMORE, Calif. — Astronomers for the first time have taken snapshots of a multi-planet solar system, much like ours, orbiting another star. The new solar system orbits a dusty young star named HR8799, which is 140 light years away and about 1.5 times the size of our sun. Three planets, roughly 10, 10 and 7 times the mass of Jupiter, orbit the star. The size of the planets decreases with distance from the parent star, much like the giant planets do in our system. And there may be more planets out there, but scientists say they just haven’t seen them yet. 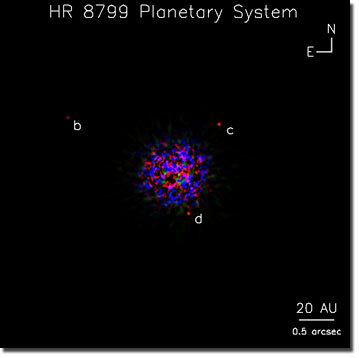 Using high-contrast, near-infrared adaptive optics observations with the Keck and Gemini telescopes, the team of researchers from Livermore, the NRC Herzberg Institute of Astrophysics in Canada, Lowell Observatory, University of California Los Angeles, and several other institutions were able to see three orbiting planetary companions to HR8799. Astronomers have known for a decade through indirect techniques that the sun was not the only star with orbiting planets. During the past 10 years, various planet detection techniques have been used to find more than 200 exoplanets. But these methods all have limitations. Most infer the existence of a planet through its influence on the star that it orbits, but don’t actually tell scientists anything about the planet other than its mass and orbit. Second, the techniques are all limited to small to moderate planet-star separation, usually less than about 5 astronomical units (one AU is the average distance from the sun to Earth). In the new findings, the planets are 24, 37 and 67 times the Earth-sun separation from the host star. The furthest planet in the new system orbits just inside a disk of dusty debris, similar to that produced by the comets of the Kuiper belt of our solar system (just beyond the orbit of Neptune at 30 times Earth-sun distance). “HR8799’s dust disk stands out as one of the most massive in orbit around any star within 300 light years of Earth” said UCLA’s Ben Zuckerman. In some ways, this planetary system seems to be a scaled-up version of our solar system orbiting a larger and brighter star, Macintosch said. The host star is known as a bright, blue A-type star. These types of stars are usually ignored in ground and space-based direct imaging surveys since they offer a less favorable contrast between a bright star and a faint planet. But they do have an advantage over our sun: Early in their life, they can retain heavy disks of planet-making material and therefore form more massive planets at wider separations that are easier to detect. In the recent study, the star also is young – less than 100 million years old – which means its planets are still glowing with heat from their formation. “Seeing these planets directly – separating their light from the star – lets us study them as individuals, and use spectroscopy to study their properties, like temperature or composition,” Macintosh said. “Detailed comparison with theoretical model atmospheres confirms that all three planets possess complex atmospheres with dusty clouds partially trapping and re-radiating the escaping heat” said Lowell Observatory astronomer Travis Barman. The planets have been extensively studied using adaptive optics on the giant Keck and Gemini telescopes on Mauna Kea, Hawaii. Adaptive optics enables astronomers to minimize the blurring effects of the Earth’s atmosphere, producing images with unprecedented detail and resolution. LLNL helped build the original adaptive optics system for Keck, the world’s largest optical telescope. Christian Marois, a former LLNL postdoctoral researcher and the primary author of the paper who now works at NRC, developed an advanced computer processing technique that helps to extract the planets from the vastly brighter light of the star. A team led by Macintosh is constructing a much more advanced adaptive optics system designed from the beginning to block the light of bright stars and reveal even fainter planets. Known as the Gemini Planet Imager (http://gpi.berkeley.edu), this new system will be up to 100 times more sensitive than current instruments and able to image planets similar to our own Jupiter around nearby stars. Near-infrared false-color image taken with the W.M. Keck II telescope and adaptive optics. The three planets are labelled b, c, and d. The colored speckles in the center are the remains of the bright light from their parent star after image processing. KurzweilAI.net — This is good news since we’re all getting older and if you’re reading this I guessing you do at least a little web surfing. Surfing the internet increases brain activity in older adults. In an experiment, adults 55 to 78 years old who have regularly searched the Internet showed twice the increase in brain activity in MRI scans when performing a new Internet search than their counterparts without Internet search experience, especially in the areas of the brain that control decision making and complex reasoning, UCLA researchers have found.